Every time I read a Karen Cushmanbook, I always wonder if I will be able to make it all the way through. Karen is brilliant at writing within a time period and creating characters I completely connect with. The issues that have me wavering in my reading are that the times in which these children live are extremely harsh, unfair, and at times abusive towards children. As my daughter reminds me, "These were unfair and harsh times for everybody." Is what keeps me reading these books are the wit, strength, ingenuity, passion and hope which fill every single page. 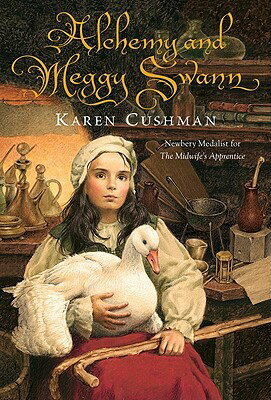 Alchemy and Meggy Swann by Karen Cushman, doesn't disappoint. I had so much sympathy and concern for the main character Meggy Swann. Meggy was born lame and has to use crutches to walk painfully through London town. Meggy is a new arrival in London. Her father, the alchemist, has sent for his child,who he thinks is a boy. what a surprise to find a lame daughter! Lame she may be but she sets out to prove that she can help the alchemist turn metal into gold. Throughout the pages, we take a tour of Elizabethan London. Meggy discovers that she is brave, strong, and has a witty tongue with her rhyming skills. Along the way she meets tried and true friends, which add many colorful moments to the story. Does Meggie turn metal into gold? You'll just have to read and find out for yourself. This quickly has been put on the "read again" list of my children and their friends. Be sure to join us for our Jump Into a Book Reading Adventures. They start next Monday. To find out more about it have a look here. There are so many things we can do from this book, but one that caught my eye was the amount of card games they played. There are three games that I had never heard of before and so we decide to play a few rounds of Primero, Trumpit, and Gleek. Before we get started, here are a few terms to help you understand card playing. Face value: The numerical value of a card. Now let's play some card games! Primero: The game of Primero appears to have been one of the earliest card games played in England during the Renaissance and the Tudor dynasty. The earliest reference to it comes from a book written in 1526. It is also known as the mother of poker. We found some very simple rules here and enjoyed this game immensely. Trumpit: Today we call this game trumps. It's trick winning card game. Each person selects their own suite (clubs, spades, diamonds, hearts). It's a complete secret and as the game progresses you carefully collect and declare your secret suite. The person who gets the most of their suite trumps the other's and wins. This game is better to play with older children. There is another version of this game which is cards and a board game called Trumpet. Gleek: Gleek use to be a very popular card game in coffee houses about 385 years ago. Gleek is actually a german/anglo saxon word which means equal. Here are the easy rules for Gleek. Object: To make the highest scores. The cards: A 44-card deck made by removing all 2s and 3s from a regular pack. Also, give each player an equal quantity of chips. To play: Deal 12 cards to each player. Turn up the next card to determine the trump suit. Leave the seven remaining cards, or stock, in a face-down pile. Bidding for the stock: Player at left of dealer automatically begins the bid at 10 chips. In turn, players increase the bidding by two chips at a time, or else drop out of the bidding. The high bidder pays each opponent half the bid amount. Without revealing any cards, the high bidder then discards seven cards from his or her hand and replaces them with the stock cards. Ruff:All players toss two chips in a pool. 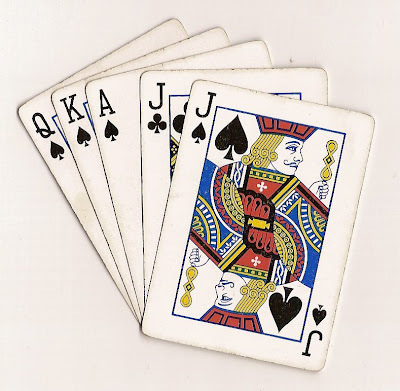 Starting with the high bidder, players vie for who has the best suit (i.e., the highest card value in a single suit, determined by adding up the cards in that suit): Ace counts 11, kings, queens, and jacks 10, and all others their face value. Starting with high bidder, either pass or vie for Ruff by betting two chips. Players may pass or see the vie by putting in two chips. They may also revie by adding two chips more. Other players must see the vies or revies or pass. Once all vies and revies are seen, the suits are shown, and whoever has the highest count in one suit wins the chips in the pool. Trick play: The high bidder leads to the first trick. Follow suit if possible, otherwise play any card. A trick is won by the highest trump played, or else by the highest card of the suit led. Winner of each trick leads to the next. By tradition, if the trump card turned up at the beginning is one of these honors, add it to dealer's score. Now, subtract 22 points from each player's score. This will give you the number of chips each player wins and loses. Variations:It is common for the player having tiddie (the 4 of trumps) to claim two chips from each player. Tiddie can be claimed at any phase of the hand, and if tiddie happens to be the card turned up at the beginning, dealer claims the chip reward immediately.